An offshore capable cruising boat with shallow draft. The program of this boat is offshore cruising with comfortable accommodations for 2 during long cruises, maximum 5 during shorter cruises. Seaworthiness and safety at sea. Access to protected remote anchorage's or to shallow water sailing areas like the Bahamas or Friesland. Upright grounding in tidal harbors on the wide keel. Ease of building and maintenance, economical to own. The seaworthiness may come as a surprise to beginners or to those who have never sailed a shallow draft boat but experienced seamen know that the shallow draft boat is more seaworthy than a hull with a deep keel. Unlike the deep boat, a centerboarder will not resist the sea. Instead of tripping on it's keel, it will dodge the waves or lift over them. Properly designed, a keel centerboarder will have the same ultimate stability than a boat with a conventional keel. All over the world, lifeboats are shallow draft. Slocum sailed around the world in a shallow draft boat, my daughter's Presto style sharpie was 55' long but had less than 4' draft and sailed 2-1/2 times around the world and I sailed half around the world in a 41 footer with 3' draft. But there is more to it than safety at sea. In case of real bad weather like a hurricane, a shallow draft boat can take refuge deep inland or in very protected coves inaccessible to deep boats. The centerboarder can, with only a small tide, be beached for repairs or to clean and paint the bottom. It can go on anchor where nobody else can and save on marina fees. Altogether, shallow draft is the way to go for a serious cruising boat. That type of hull is also ideal for the amateur builder. A keel casting is costly: easily $ 5,000.00 with shipping in the case of a 25' boat. In our boats, the wide keel is integral to the hull (no leaking bolts) and filled from inside with lead ingots and lead shot cast in resin. If transportation to the launching place is problematic, the lead can be installed at the last minute just before launching. Since many still believe that a deep keel is a must for stability, here is the roll over chart for the VG25. As you can see the VG25 has a positive righting arm until 137 degrees. The area under zero is very small and returns to null at 180. This means a stiff boat that is very unstable if it ever turns turtle. Many production boats in that size have positive stability only up to 110 or 120 degrees. Most production boats in that size have little storage room and no payload capacity. Serious cruising entails carrying stores for the length of the cruise. Not only food, water and fuel but spares and extra gear. The VG25 has much more payload capacity than other boats in that size. The figures show a light to medium displacement. The light displacement is the complete boat with it's gear and equipment but no crew or stores. Cruising displacement means weight with the crew and all what it takes to cruise: fuel, water, food, stores, gear, spares. Our designed waterline is at cruising displacement. You can add more weight, the PPI (pounds per inch of immersion) tells you how many lbs it takes to bring the boat down 1”. You will rarely see those figures listed for production boats. Their displacement is usually very close to our light displacement. Please do not compare the VG25 to light weekend boats of the same LOA. Instead, use the LWL (length at waterline) as a base. The hull shape is our trademark 5 panel hull. Easy to build and good performance. We packed a lot in a 25' hull to keep material cost and marina fees down. The beam is within the legal towing limits with a wide tow permit. That permit cost $ 10.00 in most US states. The Vagabond 25 is not a boat that you tow to a ramp for a Sunday sail. She should live in the water but can be towed home for winterization. The hull material is our epoxy-fiberglass composite with a plywood core. This is basically a plywood stitch and glue skin between heavy structural fiberglass in epoxy. Easy to build and stronger than single skin fiberglass. The 7/8 sail plan is traditional but with a large mainsail and small jib. This makes sail reduction easier and eliminates the need for a furling jib. It is always easier to reef a main than to change a foresail. The small jib can be fitted with a reef line too. The small jib allows us to have a wide shroud base. 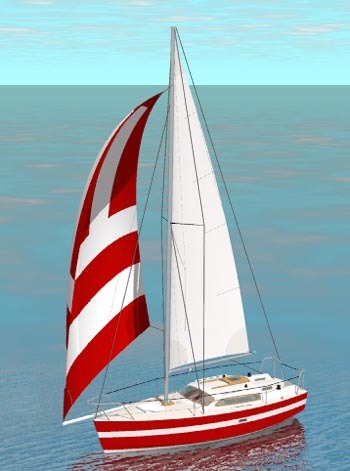 For light weather sailing or long downwind runs, the plans show a retractable pole to use with a gennaker or triradial. The pole fits on deck and can be a plain aluminum spi pole or a carbon fiber pole with spi pole end fittings. A bobstay is shown but optional. We show single swept back spreaders and a single backstay offset on the transom. Those who prefer can opt for a split backstay with tensioner. The complete wardrobe is made of 4 sails: main, jib, tri-radial and storm jib. A simple ad economical. The VG25 is powered either by an outboard on the transom or an inboard diesel. The outboard fits on a standard outboard bracket sold in most marine stores. A 6 HP is sufficient, max. 15 HP. The plans show two versions of the boat, one for outboard and one with an inboard diesel. The outboard has a small fuel 6 gallon tank in a cockpit locker. The recommended inboard diesel is Nanni diesel (Kubota based) with saildrive. Other saildrive diesels can be installed. There is a 20 gallon diesel fuel tank. The diesel engine takes some room in the aft cabin. With the inboard engine, the aft berth becomes a single one instead of a double. 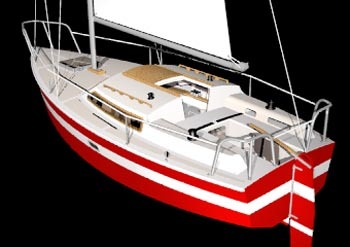 The VG25 is fitted with an integral keel and centerboard trunk. No welding, no expensive casting, no difficult keel to hull assembly. It is also stronger. 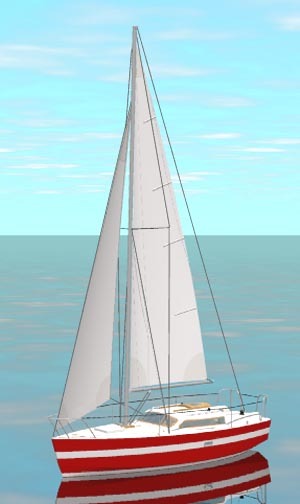 The VG25 can sit dry and stable on its one piece keel without any additional support or bracing. That feature allows the boat to dry out without help in tidal harbors and makes bottom cleaning and painting on a tidal beach possible: no more expensive haulouts! The wide centerboard trunk makes maintenance easy: the CB can be removed while afloat and the trunk cleaned and painted. The rudder is deeper than the keel but a very simple design feature allows it to slide up for sailing in shallow waters or beaching. Starting from the bow, there is chain locker accessible from the deck followed by a double vee berth. The vee berth is 76” long in diagonal and there is enormous storage room under the berth (the boat is designed to take weight there). There is a wide hatch over the vee berth. 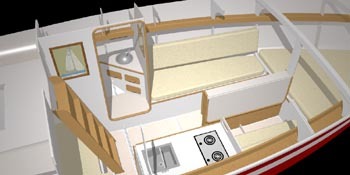 The saloon has a 6' 4” berth on the port side and a shorter seat followed by a galley on the starboard side. The centerboard trunk support a table with folding (panels). We show a dorade type vent but other ways to ventilate the cabin can be used: opening ports, louver doors etc. 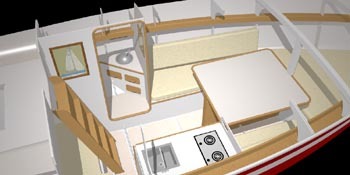 The galley has sufficient room for a small fridge, a double burner stove and sink and even a small microwave. The galley uses on of the two fresh water tanks: 17 gallons. There is 76” headroom in front of the galley. On the port side, there is an enclosed head, headroom is 68”. The head connects to a 40 gallon black water tank located behind the head. The head is vented thanks to an invisible dorade type vent located in the cockpit backrest. Behind the head, there is storage room above the pump out tank. In the standard version, there is no access to storage from the cockpit seats. The cockpit is completely watertight for strength and safety in bad weather. Sails can be stored behind the head, under the cockpit. This makes sense since very few sail changes are required. 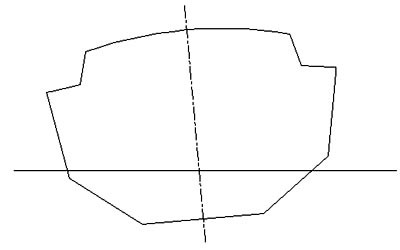 As an option, the plans show a full bulkhead behind the head and a wide cockpit seat hatch. This creates a wet locker. For that option, we show a sole in the locker, above the water line. On the starboard side, there is small desk with shelves behind the galley, ideal for electronics. It is followed by a wide and long double berth. The outboard side of the berth is 83” long, the inboard side is 74” long. The whole berth can be made 16” longer if the builder sacrifices the small outside cockpit lockers. 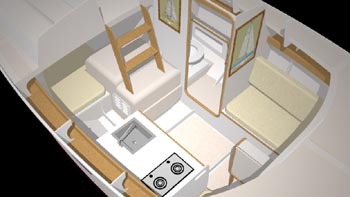 The berth fitted with a cloth leeboard can become a snug pilot berth under way. There is plenty of storage under the aft berth. 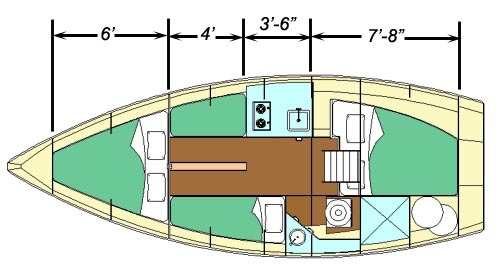 The aft cabin opens to the saloon but a curtain can be installed behind the companion way ladder. For light, there are two Lexan windows in the cockpit sides. The aft cabin is with a vent in the ceiling. That vent is located in the forward part of the cockpit backrest and made water tight through a dorade type baffle. The opening can be closed in case of bad weather. There is good seating headroom at the head of the berth: 50”+. Access to the deck is through a companion way fitted with a standard hatch and two drop down panels. The companionway is separated from the cockpit by a wide bridge deck. This not only provides headroom to the aft cabin but is a required safety feature for a blue water boat. The cockpit has comfortable benches with wide backrests extending from the cabin sides. There are small storage spaces in the backrest for winch handles, binoculars etc.. A main sheet traveler runs along the edge of the bridge deck, this is another safety feature since the main sheet is often used as a grab handle while moving around. Under the cockpit benches, on the transom side, there are P & S wet lockers that drain overboard, for fenders and docking lines. 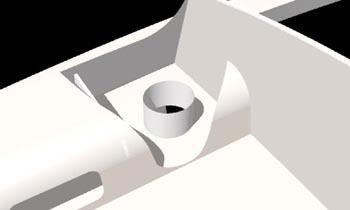 The cockpit and seats are slanted and drain over board, the plans show wide scuppers. On deck, we show a suggested layout with the CB painter line returning to the cockpit but we leave halyards on the mast. Those can be returned to the cockpit if the owner prefers. 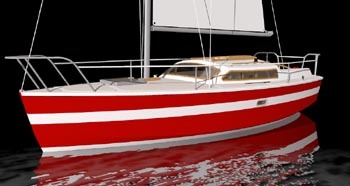 The VG25 hull is made of a plywood core between structural fiberglass/epoxy skins. This means that we build a relatively light plywood hull assembled in stitch and glue and build strong fiberglass skins on each side of the plywood. The strength comes mostly from the fiberglass and epoxy, not from the plywood. The standard deck and cabin top are made in foam sandwich but we show a plywood version as an option. The VG25 can be built either in a basket mold or the traditional way, upside down on a simple jig. Due to the large size of the panels, it becomes difficult to use a basket mold for boats 25' or larger. In this case we prefer to build the hull upside down on a jig. Building a boat hull upside down on a jig is the traditional method described in most books about wooden boat building. The jig can be made of the boat's frames and bulkheads or from throw away molds. The plans show how to build a frame to roll the boat. This is not as difficult as a first time builder may think. 1.Set up a male jig made from molds with a few ribbands. 2.Cover it with the hull panels. 3.Build fiberglass seams and fiberglass the outside of the hull. 4.Turn the hull over and remove the molds. 5.Fiberglass the inside of the hull. 6.Install the interior framing, finish the inside including main systems like tanks, inboard engine. The building is as simple as any other stitch and glue boat: it will take longer to build than a small skiff but does not require more tools or better skills. The plans include a step description of the hull assembly. The builders should have a basic understanding of sailboats and have build at least one small boat using our method. We supply complete diesel inboard installation drawings with our kits if that option is chosen. The main one is an inboard diesel engine. We could not fit a straight shaft engine without loosing most of the saloon but a saildrive fits quite well under the companionway ladder. There is no miracle, you must accept to loose part of the aft berth. It sill leaves a nice wide and long aft berth and plenty of storage space. The fuel 20 gallons shares the space behind the head with the blackwater tank and the exhaust takes the place of the outboard tank in the rear port locker. 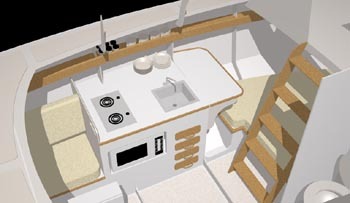 There are plenty of other small options shown on the plans and you can customize the interior as long as you keep all bulkheads where we show them. For serious long distance cruises, like a 6 month cruise for two to the Caribbean or some other long range expedition, I would add a sole in the forward part of the saloon. Raise the seats and table, there is room and use the space under the sole for storage. This will keep the CG low and since you do not need standing headroom where you sit, it is a win-win option. Along those lines, the VG25 has a nice feature. The displacement is calculated for a well loaded boat. If she is used mostly for week-end cruises, the weight of the stores can be replaced with 500 lbs of lead ingots to bring her to her waterline. If later the owner wants to sail away on a long cruise, he can remove the ballast and load the boat with plenty of water, fuel and stores. These plans are now on sale. Study plans with an extract from the BOM and full details are also available on the bateau.com web site.